Hi! You’ve probably arrived from Ruza‘s blog, and now you’re visiting me (Suzanne)! Thanks for stopping by to see what I’ve created for this month’s DeNami Blog Hop! I made a tag for each treat using the heart stamp from DeNami’s Sugar Cookies Trifles stamp set, stamping it once on kraft cardstock, then again on white cardstock in brown ink. I layered the white stamped image on the kraft image, and colored the “sprinkles” with a marker. The sentiment on each tag was stamped with watermark ink (from DeNami’s Love Sentiments Petit Fours set), then heat embossed with white embossing powder. I used an opaque white marker to create the border, adhered the heart to the tag, then adhered the red strip onto the kraft tag. Then, I filled a paper cupcake wrapper with candy and placed it in a clear treat bag. The tag is then tied to the clear bag with a combination of red raffia and red/white twine. My second project is a pencil topper. I stamped and colored DeNami Design’s Puppy Love Circle stamp, then used a metal die to cut out the image. 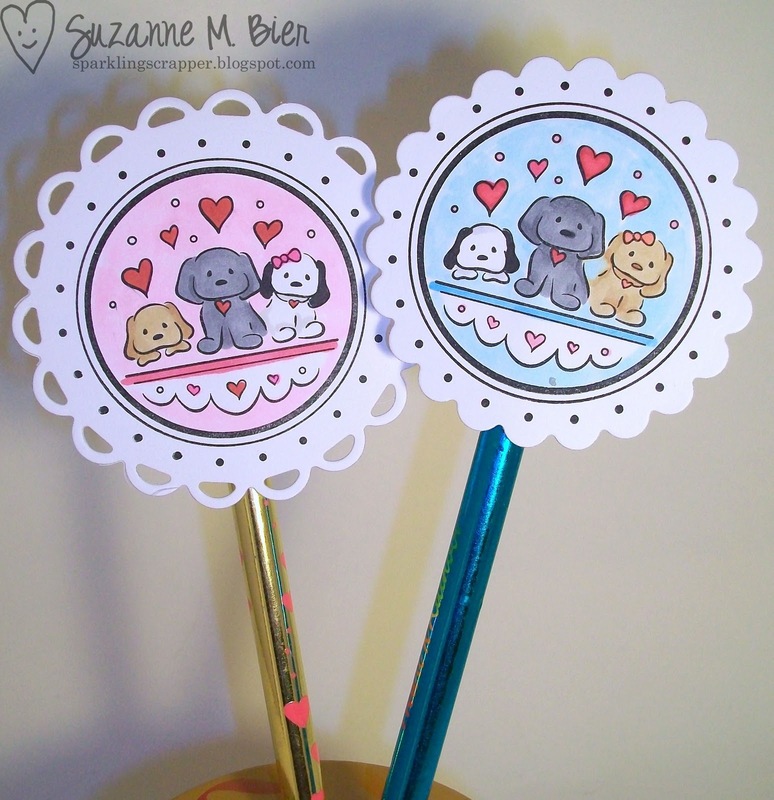 If you have a coordinating circle or scalloped circle punch, that will work, too! I rolled a 1/2″ strip of white cardstock around the top of the pencil, securing the end with adhesive. I rolled a glue dot onto the seam of the rolled strip, then adhered the stamped image. Finally, to strengthen the topper, I cut a 2 1/2″ long strip of white cardstock, rolled adhesive on the strip, then lined it up with the back of the topper and adhered it. The extra strip helps to keep the design from curling. Don’t forget to leave comments on all of the participants’ blogs for a chance to win a $20 gift certificate to DeNami Design’s web store! You have until January 9, 2012 at 11:59 pm Pacific Time to leave your comments! Your next stop on the hop is Tammy‘s blog! I’m sure she’s created something sweet to show you! If you need to get back on track, visit the DeNami blog for a list of all of the hop participants! And be sure to leave them some love to let them know how much you’ve enjoyed the hop! I hope you’ve been inspired by my projects! Thanks so much for stopping by! Suzanne: Both your projects are just darling! 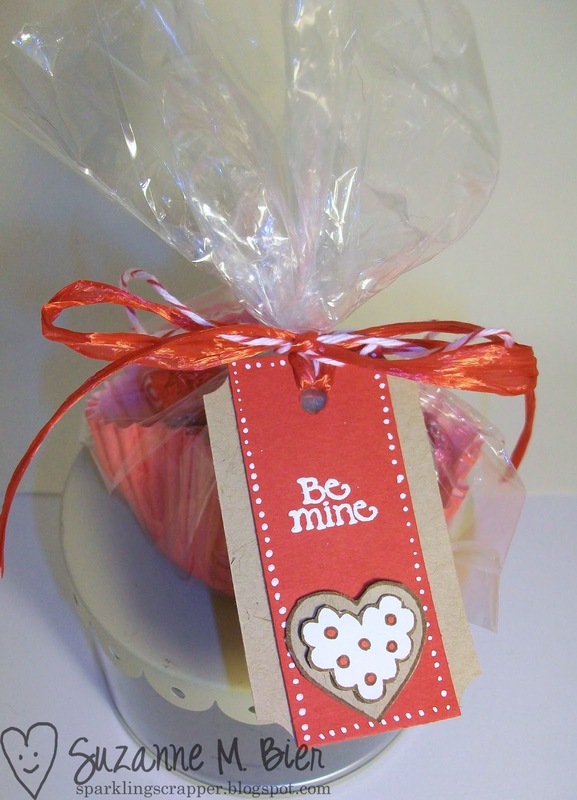 Love the tags for your treat bag! The Kraft and Red works so well together and the red embossed on the white pops so beautifully. (I think we were on the same wavelength) Your pencil toppers are just adorable! Great displays of some DeNami Goodness in a fabulous way! Love all of your awesome projects!!! Great projects. I love them both. Great little Valentines for people. Thanks for sharing! Wow! Love both of these! I'm going to have to make a card using kraft/red soon! how fun…love these fun ideas…thanks for sharing. 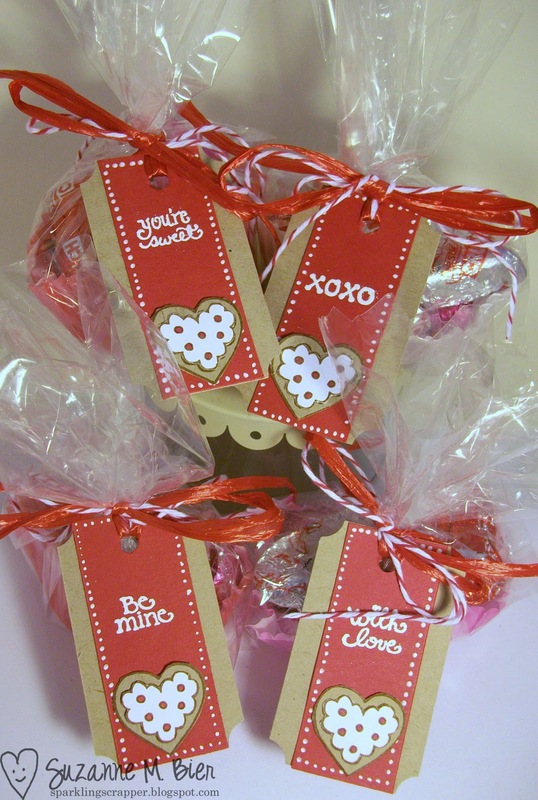 Wow- such great Valentine projects! I love the tags on the goodies- so cute and the dotted “stitched” border is such a great touch. Your pencil toppers are adorable; such a cute image. Great job on all of these! These are all so adorable! Great ideas! Thanks so much for sharing! I can see those pencil toppers stuck onto lollipops! Your projects are so cute! I pinned the pencils with the three puppies on Pinterest. It's such a cute idea. These are both such adorable projects! I may very well have to nab them for use in my third-grade classroom! They are darling! Sweet duo of projects Suzanne! Love the red and kraft combo on your tags and the pencil toppers are super fun! Very cute tags! I also love the coloring you did on the pencil toppers! Very nice work! Suzanne, these DeNami Valentine treats are FABULOUS!!! Your tags for the treat bags are delightful and your pencil toppers couldn't be more adorable. I LOVE what you've done! Thanks so much for sharing your sweet designs as part of the DeNami Valentine Blog Hop! Suzanne these are so awesome! I'm totally going to CASE your treat idea because your packaging is just so cute girl! How nice to tag treats…I'd be saving it as a book marker after devoring the treats! I was just blow away by your cute pencil toppers! They are adorable, and that's the first I've seen of that particular stamp on this hop. So cute!! What neat projects!! Anyone would love to receive them! Thanks for sharing Suzanne, they are beautiful! Cute, cute! I just love these little cookies! Those tags are to die for! And I love the adorable little puppies on the pencils! How cute!! I especially love the pencil toppers…creative! Oh my gosh, these are fabulous! I seriously wish I was a kid again so I could get fun stuff like this in class on Valentine's Day! I LOVE both of these ideas! The pencil topper would be such a hit for my younger cousins….might have to make some! 🙂 Thanks so much for the GREAT inspiration! The treat tags are so cute! Love the color choices. Never would have thought of pencil toppers! They would make a great gift for Valentine's parties! NO WAY, I love both of these projects. I love animals so much, and the hearts are really cute! Love both projects but my fave is the crayon topper. This will be a sweet delish to give out to the kids. Hi Suzanne! You have a great set of cute cards. Like your projects and I want to share this with the kids.